Work from home or stay productive on business trips, with seamless access to your desktop computer. Working from home. Away on business trips. Or maybe you just need a break from your office desk. With TeamViewer remote access tools, you can stay productive no matter where you are. Wherever life takes you, your desktop files and applications are just a few clicks away. Supported by a blazing-fast global network, TeamViewer™ free remote access software tools enable you connect to your work computer, from anywhere, anytime. So you can continue working with desktop applications remotely. And access desktop files, as if you were sitting in front of your workstation. Quickly. Easily. Securely. Connect to Your Desktop Remotely. Without Slow VPN or Network Security Restrictions Getting in Your Way. “VPN works fine on public Wi-Fi,” said no one ever. Cafe Wi-Fi. Shared hotel internet. Unsecured airport network connections. Sure, you have VPN access to your company systems. But, face it. Working remotely with VPN on public Wi-Fi isn’t a productive combo. Working remotely means you need access to files on network drives. And programs from your office desktop. With TeamViewer, you get a VPN alternative that’s simple, affordable, and secure. So you can log in to access your desktop computer remotely, no matter where you are. Engineered with cloud-based network compression and end-to-end encryption with 256-bit RSA keys, TeamViewer enables you to reach your desktop files securely. Without needing VPN. Anytime. Even on public Wi-Fi, mobile hotspots, and slow connections. TeamViewer helps you work productively, anywhere. Work emergencies happen. Systems go down. Legal issues come up. IT emergencies don’t care if it’s the weekend, if you’re sick, or if you’re away on vacation. With TeamViewer’s remote access solution, you’re always just a few clicks away from your work computer. Reach your network files. Resolve unexpected problems. No matter where you happen to be. Not near your laptop? Use the TeamViewer mobile app for iOS, Android, or Windows Mobile. Connect instantly from mobile devices to any remote desktop. Access your files and desktop apps. Print remote files on your home printer, straight from your phone. See everything on your high-resolution remote desktop display, automatically resized to your phone’s screen. 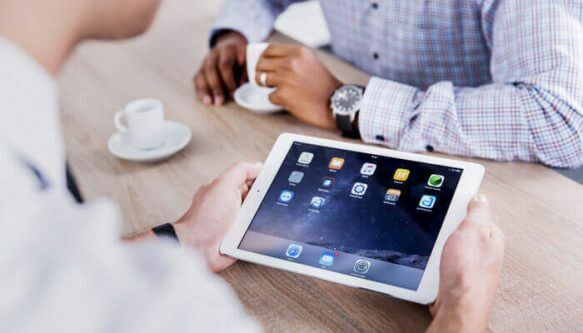 TeamViewer’s cross-platform support allows you to connect to any device, from any device. TeamViewer is the world’s favorite remote desktop tool, with over 30,000 new downloads every hour. TeamViewer allows system administrators to access remote servers. Securely. From anywhere. Without needing VPN. Business users can use TeamViewer to remotely access their work computers while traveling or working from offsite locations. Download and install TeamViewer remote desktop software on the computer you need remote access to. Set up Unattended Access. Name your computer and set a password. Install TeamViewer on the computer you want to use to access the remote computer. Add the device to your partner list. To access the remote computer, select the remote computer name from your Partner List and connect. Once connected, see the remote desktop screen, take control of the mouse and keyboard, and work on it like you’re right in front of it. Put the remote computer to sleep and wake it up from within TeamViewer when you want to access it again. Print documents locally, from the remote computer that your’re accessing when connecting between Windows devices. Try our products free with a 7-day trial. We’ll send you everything you need to get started immediately and enhance your team’s productivity.